Fostering a culture of public practice is central to the ACPS Instructional Coaching mission and as such, we spent time as a team in the 2017-2018 school year identifying new avenues for sharing our work and connecting teachers to each other across the division. Formative work in the beginning of the year led to increased momentum in the spring as coaches employed a variety of social media platforms. In the course of our work, we published five blog posts and hosted our our first #ACPSConnect Twitter chat. We’re excited for this year and a launch with a renewed sense of energy and enthusiasm. Connect teachers in ACPS and create opportunities to share researched-based practices around curriculum, assessment, and instruction. There are many ways to connect in ACPS and we trust that the use of social media tools will add one more outlet for teachers to find collaborative partners, whether they are coaches or other teachers within the district. Ideally, these partnerships will lead to teacher reflection, revision and an actualization of their instructional goals. By making this work public, we aim to improve the depth and significance of professional learning for ACPS faculty and impact student academic growth. 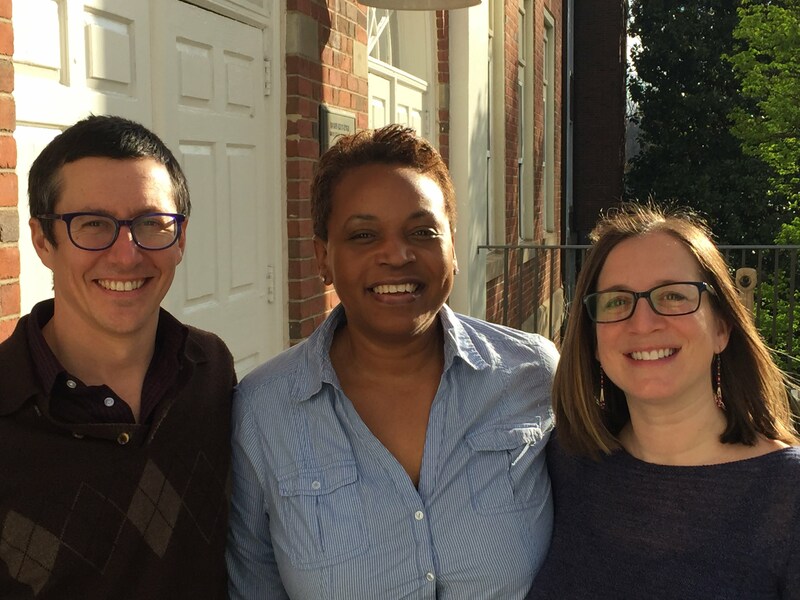 The Instructional Coaching blog will remain at the heart of our work to foster connections between ACPS educators. We also plan to update the Instructional Coaching website and sponsor additional Twitter chats and collaborative posts, both with coaching team members as well as outside experts and educators. Additional innovations for this year include the possibility of a discussion board and a more deliberate link to the many opportunities ACPS employs to build connections between faculty. We look forward to growing with our audience and welcome your feedback and collaboration. Change. The life of a teacher is filled with it. Change in curriculum and instructional resources available to teachers. Change in student demographics and the learning needs they bring to the classroom. 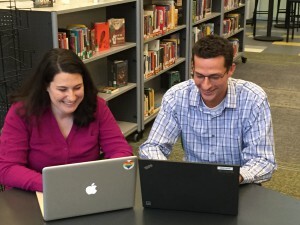 Change in the colleagues teachers partner and collaborate with from year-to-year. Perhaps more than any other word, ‘change’ best captures the experience of being a teacher. A coach can be an invaluable support in the midst of this change, helping teachers navigate the highs and lows of a year filled with newness. Or they can be one more challenge piled on top of the ever-full plate of an educator. It all depends on the coach’s approach. 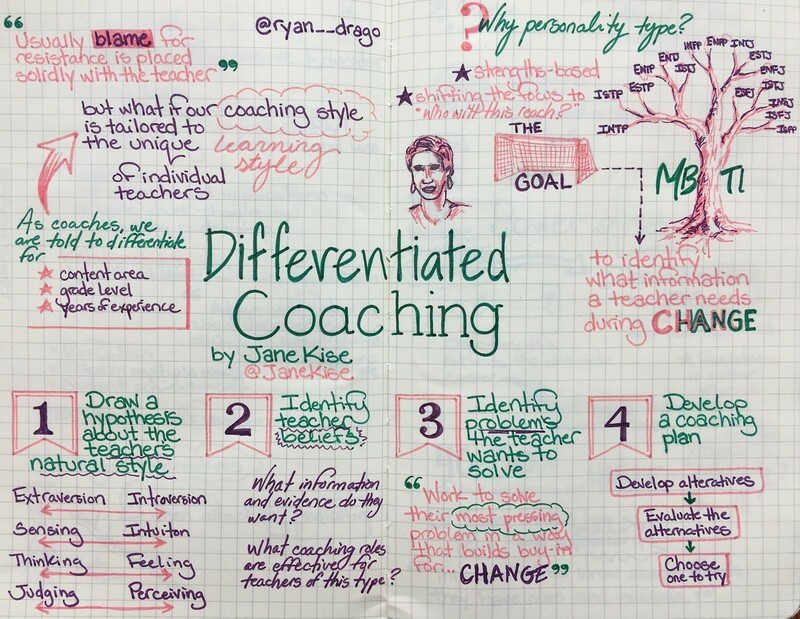 One approach to helping teachers navigate change is Differentiated Coaching. 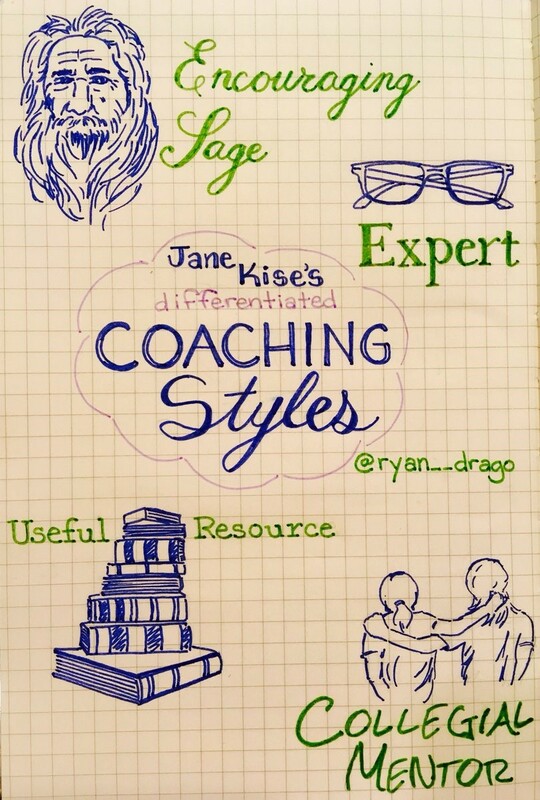 Based on Jane Kise’s work with Myers-Briggs personality type and coaching, Differentiated Coaching is about understanding what people need during change based on their personality type. You might remember your college advisor talking to you about your Myers-Briggs type, telling you what careers might be a good fit for you based on where you landed on four pairs of components (Introversion-Extroversion, Sensing-Intuition, Thinking-Feeling, and Judging-Perceiving). Understanding yourself in terms of personality type can help you understand how you function most effectively at school or work, what helps you recharge after a long day, even who might be the right person for you to marry. In other words, your personality type drives decisions you make and shapes the ways your needs are best met. That’s where Differentiated Coaching comes in. Kise advocates for coaches to learn about teachers’ types, to understand what approaches will support those types in times of change, and to target coaching to the specific needs of each teacher as they work through change. “Times of change” might be a great way to sum up the day-to-day work of teaching. It has been a constant theme for the teachers I have worked with. Changes in learning environment, planning for instruction, assessment practices, team dynamics, parent expectations, and on and on. 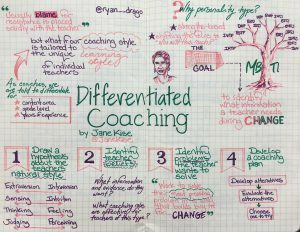 Differentiated Coaching has been a vital tool in enabling me to be responsive to the needs of teachers during these times of change. Some teachers are looking for a coach to play the role of resource-gatherer, collecting and sharing strategies and ideas that help the teacher envision moving forward. Other teachers want what Kise calls an “encouraging sage” to advise them as they travel down a new path. Still other teachers need a mentor, someone who has been there before and can model the process for them as they work through change. In the coaching partnerships I have had over the past two years I have found myself playing each of these roles with different teachers of different personality types. Somebody once told me that a coach must be a chameleon. Never does that feel more true than when I think about teachers’ types and the Differentiated Coaching stance that I take on to support teachers’ personalities. Until recently, my understanding of how to achieve equitable results in schools was incomplete, limited to my own experiences with my students and both productive and casual conversations with other educators. When I started teaching, the phenomenon of 90-90-90 schools dominated conversations about equity. In November, a couple dozen Diversity Resource Teachers, Instructional Coaches, and Administrators attended a professional development session with Zaretta Hammond, author of Culturally Responsive Teaching and the Brain. She clarified the end result of equitable practices and this remains the idea I calibrate against. She described an equitable school system as one in which a student’s success cannot be predicted based on race, color, ethnicity, national origin, creed, sexual orientation, or gender identification. The National Equity Project defines Coaching for Equity as “the practice of listening, teaching, provoking, guiding, and supporting people to achieve mutually agreed upon objectives that interrupt historical patterns of inequity.” I struggled to visualize many coaching conversations that both moved a teacher towards actualizing a named goal AND interrupted “historical patterns of inequity”. Equity implicit and equity explicit coaching are the two paths this work can take, clarifying for me how this work fit within the framework of our coaching model. In an equity explicit coaching model, identifying and interrupting practices that create or maintain disparities in student outcomes is always a primary goal. An equity implicit coaching model, like ours, is meant to support teachers to improve learning outcomes for all students, equitable outcomes being an unspoken or secondary objective. All of these definitions provide me with a target and boundaries to refine my practice. In response to a challenge by Zaretta Hammond, I am beginning to recognize and respond to deficit thinking – perceptions that students’ lack of success in school is attributed to deficits in effort, income, culture or capacity to handle a heavy cognitive load. In order to respond with respect and humility, I set my intention to listen with empathy to honor the teachers’ feelings and requests before responding to reframe or refute the unproductive belief. Ultimately, I hold in mind that students are at the center of our work as educators and I have a moral responsibility to advocate for their well-being and growth. For me, it is a moral imperative and part of my civic duty to facilitate a process where student voice is celebrated. Students should be able to enter into an educational environment understanding that: 1. My learning experience in school can thrive here. 2. I am appreciated and valued, and 3. That we (teacher/student/classroom community) are partners in a shared learning experience. I entered into this profession to be an agent of change towards that end. As a product of Virginia public school systems that both failed and supported me with respect to educational equity, you start asking questions as an educator about how you can be a partner in helping equitable access be both a practice, and a language that all partners involved can understand. My intuitive understanding of what is involved in that work has been honed by professional development growth as defined in part by the resources cited above and below by my fellow coaching teammates. In this instructional coaching role, we have the gift of being reflective partners with teachers continuously working towards excellence in teaching practices. Essentially that involves: mastery of content, relationship building, and connecting those elements with and for students towards achievement. How teachers provide access to that content resulting in mastery, should involve the work of equity at its core. Equity is a kinesthetic structural cornerstone to every relationship that we have. The work of equity requires solidity in its shared value, and requires being nimble in understanding when and where it is to be applied. It can be both a vehicle for learning as much as it can be a diagnostic tool at times to discern what measures may be needed to further impact learning. To me, our recent achievement gap data gives rise to an opportunity, to have reflective conversations about what diagnostic tools need to be in play to address change. The coaching for equity team has identified some of those tools. Yes. I say that very conscious of the fear that we have in coaching, “taking credit” for an impact on teacher practice and student achievement. As a larger issue, I think that we need to face that fear in order to grow our coaching practice. It’s well intentioned humility, and if I had to err on the side of one extreme or the other, I would choose to err on the side of not taking credit. However, lack of conviction about whether or not our specific coaching practices yield positive results is a real detriment to growth. Last year, I went through ACPS’s Culturally Responsive Teacher certification program, but modified it for my role as an instructional coach. I called it “Coaching for Cultural Responsiveness.” The certification process required that I document the impact of the work that I did. Teachers seeking certification document that specific teaching moves yield more equitable results for students. As a coach, I documented that the coaching partnership teachers and I engaged in together made a significant impact on teachers’ culturally responsive teaching practices, and, when possible, that those practices translated into equitable outcomes for students. I leaned on common readings of research, books, and articles; surveys to build awareness of the ways in which cultural modes impact teaching stance; reflection protocols; specific observation formats; and student data analyses to impact teacher practices in our coaching partnerships. I sought feedback from teachers about the extent to which teachers’ culturally responsive professional growth goals were achieved as a result of our collaboration, and the extent to which our collaboration in pursuit of specific goals that aimed at equitable outcomes for students achieved those ends. 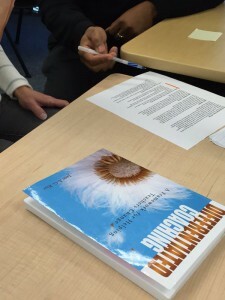 Two coaching practices that feel like good opportunities for both coach and teacher growth are writing goals and identifying success criteria that are specifically designed to achieve those definitions of equity Dabney mentioned earlier, and engaging in shared professional reading about educational equity (along with follow up conversations). In order to disrupt inequity, teachers need to try something different. Engaging in shared professional learning stimulates ideas about what to do differently, and writing equity explicit goals helps keep our eyes on the target. As for our process, this project began with a discussion during our coaching PLC. 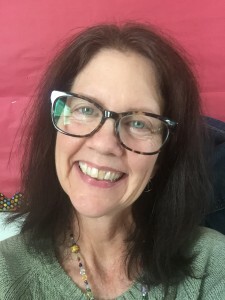 One of the Albemarle County tenets for instructional coaches is to “foster a culture of collaborative, reflective, public practice.” It was almost a reverse momentum, as Sara’s goal was precipitated by a conversation with a teacher who asked about some of the other goals she worked towards with teachers. 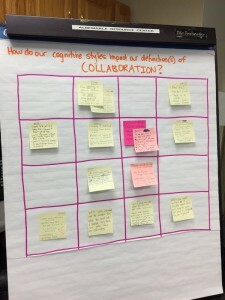 This led Sara to realize that teachers may only have a limited view of the possibilities of the collaborative work between teachers and coaches. We have discussed in our coaching clusters and PLC meetings across the team that we want the work we do to be visible. Sara and I felt that a big step toward transparency would be for the teachers to know that we have a public face through the website–and to provide current and supplemental information as well. This would help lend itself toward moving our PLC into a place that is more visible. I began my work with podcasting last year, and my impetus was mainly that as coaches we each keep separate schedules independent of each other. It made trying to schedule book studies within our PLC impossible. My thought was to embrace asynchronous communication via a podcast, where there could be conversations available around the PD we are working on. This would allow coaches to catch as catch can the information and conversations they needed to progress in their reading and self-education. The goal allowed for five podcasts around various goals throughout the coaching PLC to be shared and the coaches, in conversations, often spoke to where they began seeing overlapping concepts and practices. It was an encouraging outcome. As for this year’s goal, I have taken the ball and decided to run with it, by seeing if I can now have this type of work branch out and become more visible. Last year was about production and beta-testing the utility of the design. This year is about making it more available to all. Sara and I sat down at the beginning of the year, and as she articulated her desire to open up our coaching work to the ACPS public as well as the general public, I realized that what I was doing would tie into that. I hadn’t done much blogging, or general troubleshooting/planning around visual and content messaging at that point, so her view was well taken. We began planning out how to go about this, and make the Instructional Coaching section of the ACPS website relevant and current. Sara created a protocol that would streamline a process for coaches to develop and submit pieces. She mapped out a yearlong vision for overarching themes of blog posts that would give a balanced view of the varied work that coaches do within PLC and with teachers. The next step was to reach out to coaching teams, individual coaches, and teachers to write pieces that speak openly about the work that we do together. Our hope is to do this in an organic and inspiring way because it truly takes a willingness to be vulnerable when publishing through such a public platform. On our journey of a thousand miles, we began with one small step. We are eager to continue to gain momentum and make forward progress towards our goal of fostering a collaborative, reflective, and public practice as coaches. As we returned from winter break, fattened up from all the big meals and relaxing with those we love, it can be hard jumping back into the swing of things. During our time away from work, perhaps there were epiphanies which put everything into perspective–things that would change the outcomes of what we do in the classroom. But, as the Tao states… “A journey of a thousand miles begins with a single step.” Sometimes it’s starting out with that first baby step that is daunting. Think of it as momentum, stamina, whatever you will. It takes resolution to look that thousand miles down the road, and then begin from the complete opposite side. Lots of resolutions are made at the beginning of the new year. Running a marathon, quitting smoking, losing weight, eating healthier… and so on. With each of these, there’s often something that has to be done first to get there, and whatever that something is, it has to happen for one of the other important things to follow. 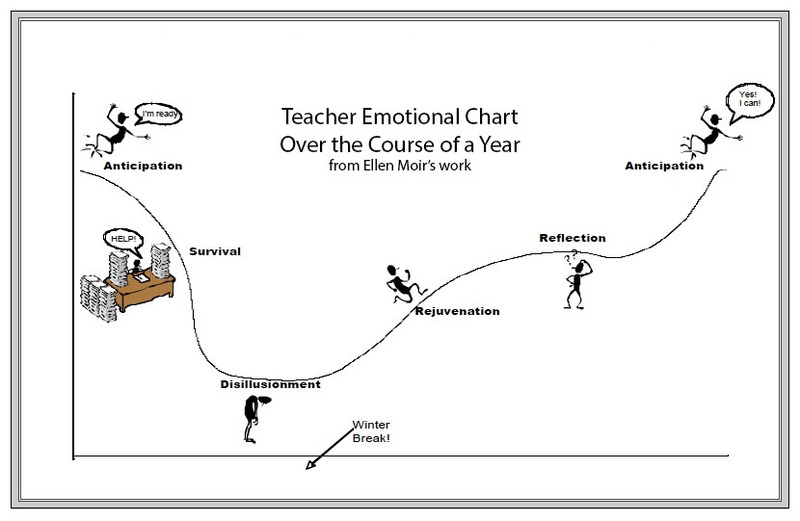 The classic chart that illustrates the roller coaster of the teaching experience throughout the year (see diagram) has January and February at the bottom of the curve. Which means from this point of the year, the only way to go is up. We want to be at that rejuvenation phase. And the first step to getting there is to consider is why and how we came up with our goal in the first place, by backtracking and revisiting our thinking. What were our motivations, what did we know/not know then that we do/don’t now? Are those motivations still the same? If not, what begs revision? In reviewing our progress and reflecting on the work done, the artifacts showing our progress are key indicators. What can we see and how will it inform our journey? That’s where Sara and I are right now. We set out to partner on one of the coaching model’s tenets–the task of “making the work public” and to do so, have been planning out the instructional coaching blog, getting a process nailed down for publishing, and so on. Our hope was to not only work toward transparency in what we do as coaches, but also to provide more lines of information around what it means to be a coach. With our work, we are able to coach for up to five years before we cycle out of the program and back into the classroom. By having a built-in end date, it’s important that we consider the new coaches coming into the fold. So, as we looked at our dual purpose, we found that there was a component to the work that was more than just putting some writing online. Sara started the ball rolling with the instructional coaching blog. We sat down and began talking through what needed to happen, and ultimately, we just said, well if it’s going to happen, then we need to get access to the site. There was already a blog there, but it was outdated. So, as Sara waded into all the old data, she started thinking about what needed updating–and then did it. She updated the coaching team’s photos, then changed the website to reflect what our coaching PLC is like now. It was procedural and slightly tedious, but that work opened the door to other work that isn’t. My role (Darren) is in the mode of support. I have a podcast I began last year, and have started a blog on my own site, so by having common interests, we started brainstorming together. The work on my site is less focused than what we’re doing with the instructional coaching blog site. I have fewer restrictions. However, this has been an interesting process for me as well, because while I’ve had fun with the podcasting and the blogging, I’m realizing that it’s terribly complicated when it comes to getting an audience. I’m learning some things here and there as I go, but there’s a learning curve that’s a little more involved than I have time to figure out. I feel that with the focused purpose and clear audience that Sara’s work has, that we hopefully will be able to find more of a path to readership. How will we know if the goal is achieved? Well, for this point in the process, it seems that our one small step is just getting the project off the ground and maintaining that progress is a success–at least for this academic year. Recruiting a diverse group of contributors, that includes both teachers and coaches, to showcase the work that is happening within schools is also a win. Being able to publish multiple blog posts that highlight the collaborative work and network colleagues is also a component of success. When I started with the podcast project last year, it was all I could do to learn the process of planning, scheduling, editing, and publishing, so when it was all said and done, I was left with five episodes, all of which were fun to record and excruciating to edit. But out of that process I learned that the privilege of being able to have a deep discussion with someone on one topic for an hour was worth the work involved in producing it into a podcast. This year, I’m learning about how to get my work heard and read. “I want my students to be able to visually track their progress through the year. And I’d like parents to be able to see this progress too.” With these words, a novice kindergarten teacher would soon find herself in a position of leadership, eventually leading to school-wide change. That statement was all that was needed to launch the power of student-led conferences (SLCs) at one Albemarle County (ACPS) elementary school. Student-led conferences are a way for parents and family members to come to school, sit beside their child and discuss their child’s academic progress and goals for future learning. The process of launching SLCs can be overwhelming at first. In this case, that process rang especially true. The idea of implementing SLCs came with only a few months left in the school year and almost zero prior knowledge about the practice among the teachers involved. Indeed, there are stacks of books and reams of professional articles that can provide guidance about how to roll out SLCs. Schools and teachers can certainly rely on those resources, but with the constraints of time and a relatively small team (two teachers and one instructional coach at the beginning), that was not the route we took. With a little bit of research and an evening spent observing student-led conferences in action at another ACPS school, these teacher-leaders were able to craft a plan, recruit other faculty members and host an evening of students and families engaged in purposeful conversations about their learning. To show reading growth, students simply shared a book that they could read at the beginning of the year and a book they could read now. For writing, they showed the first page of their journal and the most recent page. For math, students chose a math game that was currently in use in the classroom and played it with their family members. Our teacher-leaders left their evening of observation with a commitment to launch SLCs in their own classrooms by the end of the school year. As they returned to school with enthusiasm and shared their ideas with their kindergarten and first grade teammates, they found themselves surrounded by a small team that was willing to commit to also hosting SLCs by the end of the school year. Administrators provided feedback about dates and times and family communication. A small team of instructional coaches served as planning partners for teachers and as extra adults to allow students to practice. The Instructional Coaching model in ACPS is a truly collaborative one that allows teachers to be connected to every other other teacher in the county via a coach. Specifically, teachers work closely with coaches at their schools and coaches interact with each other on a regular basis. Teacher, coach, coach, teacher. As a result of this established network, I knew the Student Led Conference work was already happening at one ACPS school. Even though I had never led my own students through SLCs, when the teacher I was working with expressed her desire to share student growth with parents, I was able to tap into my bank of knowledge about what was happening on the other side of the county. Another aspect of the ACPS coaching model that contributed to the success is the structure of having multiple coaches working at each individual school. Because the two teachers had decided to complete the process of planning and hosting Student Led Conferences, while bringing along four other teachers, I knew that we would need to employ an “all hands on deck” approach. I reached out to my two coaching teammates and they dove right into the work with me. They were involved in planning, practicing with students, recording the process and reflecting with the team about successes and considerations for the following year. Further, having more than one coach at each school has allowed me to move on to work with new schools this year, while the rest of my team has continued to support those teachers as they move forward with planning SLCs for the current school year. This first year of SLCs concluded with a resounding, “This was a lot easier than I thought,” from the teachers involved. In addition to that collective sigh, teachers reflected on what went well and what they would like to change as they move forward. Children were able to talk about growth and recognize how much they changed from the beginning of the year to end of the year. Kids and parents appeared to be engaged. Parents were able to see what growth occurred. Teachers learned about each student’s personality as they interacted with families. Faculty saw different aspects of children that they might not normally see in the classroom. Students took ownership of their learning. Start using language of growth from the beginning of the year. Be more intentional when talking with students about growth and what strategies were successful for their growth. Check in with kids on a regular basis to set and review goals. Track student growth in an organized and visible way. How does all of this lead to student empowerment? A few weeks ago we held our final Year I Coach meeting and it was a celebration of transformation — from novice to experienced coach. I enjoy watching the shift as master teachers become comfortable in their role as coaches. 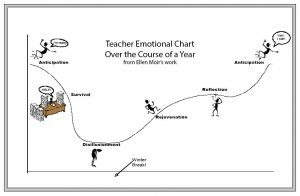 The change from teacher to coach is often a humbling journey because it’s hard to go from being a master teacher to again being a novice. This transition is also not one that can be rushed, so we provide extra support for our Year I Coaches through deliberate just-in-time professional development. Justin worked with a teacher on her implementation of Reading Writing Workshop. The teacher stated, “Justin and I have discussed the length of discussion and what goal I really want out of the conferences. He is really patient and answers all of my questions. Justin offers ideas for me to try to continue my Best Practices. I appreciate all of his hard work and meeting with me for awesome sessions throughout the year. It’s okay to be new. You will have an amazing amount of personal growth over the year. The value in coaching comes over time. For the past five years, I have been honored to work as an instructional coach in Albemarle County. Throughout these years, I have listened, reflected thoughtfully, provided support, and posed questions to build relationships and help teachers achieve their goals. The conversations, the learning – the work – have resulted in amazing professional and personal growth for me. As a result of delving into these rich, rewarding experiences, coaching has given me a valuable gift. The coaching interactions I have experienced and the different (and wonderful) schools in which I have had the honor of working have formed this gift. My dynamic, delightful fellow coaches and teachers have shaped this gift with their wisdom and professionalism. With this gift, I transition from coaching to classroom teaching so much richer and inspired. What is this gift? It is perspective. What is the purpose for deploying the tool – how does it best advance learning? How can teachers structure the learning experience to make the best use of these tools? And perhaps, most importantly, how do teachers put the choice of these tools squarely into the hands of the learner? After all, it is their learning, and they should be given the power to make these important choices. I have worked in six different schools over the course of my coaching experience, and each one possesses a unique personality that is shaped by the people who work there and the community of learners that they serve. The norms and procedures these schools have developed reflect the needs and populations of learners. And of course, the teachers, administrators and staff members who engage in the challenging work that facilitates learning contribute essential facets to the cultures that describe these schools. The perspective that working in all of these buildings has given me confirms that the needs of learners are the highest priority. Some schools might focus upon Responsive Classroom structures, others might emphasize maker spaces, and still others might be developing one of the Seven Pathways: They do this for the learners. The many teachers with whom I have worked as a coach have strengthened my sense of perspective through their willingness to work hard to get better. 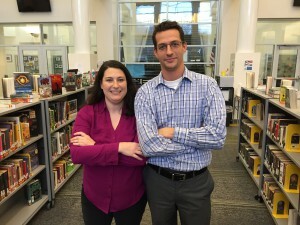 They have endeavored to adopt new structures and strategies, and they have reached across grade levels, schools, and even geographical boundaries to make learning happen for their kids. Through the lens of a coach, I have observed how brave and determined teachers are as agents of change on behalf of learners. By frequently demonstrating an openness to new ideas and professional growth, teachers regularly prove to me that they value creating amazing learning experiences for their kids. When I have choices to make as a classroom teacher next year, I trust that my coaching perspective will support the student-centered, learner-friendly choices that I witness teachers making daily. Of course, the members of my immediate professional learning community, my twenty-two fellow coaches have contributed significantly to my perspective. They have strengthened my questioning skills, challenged my thinking in positive, expansive ways, and they, without a doubt, have planted thousands of seeds in my perspective “garden”. I will certainly view my future professional interactions with a coach’s perspective: I will always search for and ask the questions that elicit my best practices. I will always value the process of thinking about learning. This perspective confirms for me that the purpose of my coaching, ultimately, is about the learners. With my skills and strategies enhanced with a coach’s perspective, I am truly ready to share the gift of learning with every student in my future classrooms. Debbie made this comment in a discussion about publicizing projects on which coaches had collaborated with teachers. On a surface level, I took this comment to mean that, when such projects are publicized, the coach should thoroughly remove his/her name from the credits so that the teacher and the work of the teacher holds the center stage. The term “invisible,” though, was striking to me. To celebrate the success of a thing in which you have participated, but to do with such thorough humility that you could describe your influence as “invisible” to an outside audience is, I think, a significantly ego-less act. The desire to be credited for good work is, perhaps, a coarse manifestation of ego. There are, however, many subtle ways in which ego-driven habits have invaded my own work with teachers. For example, when I desire to share an idea, in part because it makes me sound smart, or when I desire to connect two people, in part because I am proud of my connections, some aspect of my ego becomes a visible – albeit sneaky – aspect of the project. Or on an even more subtle level, if I find myself pushing in a particular direction because what a teacher has said resonates with something I’ve read lately, or because it sounds to me like my work with another teacher, then here again I have fallen victim to coaching through the lens of my own ego. The tools for disarming the ego and keeping the benefit of others in mind are often startlingly simple. I remember hearing John Hunter, of the World Peace Game phrase the question very deliberately, “Is there anything that anyone would like to share for the good of the group?” Though it may take some consciousness and discipline to answer that question with complete accuracy, this simple question is aimed at filtering out any habit of mind that might be founded in a self-serving attitude. There is something clean and simple and beautiful about working in this way with a teacher. Those same self-centered habits of mind that manifest in one moment seem, in the very next moment, to produce feelings of confusion, uncertainty, and even unnecessary complexity. When these thoughts are absent from an interaction, I experience a pleasant feeling of openness. Because I desire to work with teachers in such a way that, not only do we actualize the teacher’s goal, but also such that the teacher finds a similar feeling of peace in accomplishing this work, I strive to take the goal articulation a step further: “Teacher will (verb phrase)… so that students (verb phrase).” If a teacher can exercise discipline in returning to the question, “What is the benefit to students?” he/she might find a similar peace, built on this foundation of self-less work for the benefit of others. Of course, it is not this simple! It’s rare to encounter the type of person, let alone coach, who can snap his or her fingers and send out waves of selflessness. The sharp edges of ego will snag these waves and create little eddies. If I am honest with myself, I think I can see that the first eddies begin closest to home. But when I see the eddies, I can put my attention there, and iron them out a bit. That’s why I love the discipline of the selfless goal: because it forces my attention to those snags in my own character that require ironing out so that the waves can go a little further. If we can purify our own minds enough, those waves might reach through teachers and on to students, and then who knows how far they might go! You may have heard the old adage, “There are two sides to every story, and then there’s the truth.” Well, here’s the story of the ongoing coaching relationship between Derek (the teacher) and Neeley (the instructional coach), as told from both perspectives. Then there’s the truth. “What do you know about digital discussion boards?” I looked up and saw a rather tall Spanish teacher standing in front of me. I knew from my relationships with other teachers in the department that this particular teacher had never reached out to a coach before, but there he was standing in front of me asking me to partner with him. I was intrigued. Derek responded with one seemingly inconsequential line that would come to shape the course of our coaching relationship and influence my own professional learning as a coach. Enthusiastically, Derek replied, “I’ve discovered that students take more risks in the language when they can discuss with each other electronically.” Voila! I had to dig a bit, but there is was, an overarching instructional purpose, one that he was actually really excited about pursuing, one that did not necessarily have to do with digital discussion boards. Eight months, fifteen coaching interactions, and countless informal conversations later, Derek high-fived me after we had finished creating a final exam wherein students, in small groups, would collaborate to write their own creative stories in Spanish in a Google doc that they would share with other student groups in order to gather feedback and make revisions. Throughout the year, Derek had discovered that his students had indeed taken risks through discussions and projects that involved digital writing. Derek and I had worked together to actualize the student-centered goal that we had discovered through our initial conversation around the source of his excitement. I had also developed and actualized my own coaching goal: to uncover the sources of teachers’ excitement and encourage them to take risks around their excitement. Before we started working together, Derek had never had his students use tech tools to collaborate, write, share, and take risks in the language. By the end of the year, Derek had used a plethora of tools and strategies to foster student risk-taking. By collaborating with my coaching team to analyze, evaluate, and modify the strategies I was using with Derek–and other teachers–related to my own coaching goal of fostering excitement, I had become a better coach. Had Derek not responded favorably to my original question–“What are you excited about having your kids do in your class?”–I might never have discovered that asking about excitement can actually lead to excitement and that, armed with the appropriate strategies, I had the power to foster teacher enthusiasm and encourage positive change. It was my first quarter teaching AP Spanish. I felt that my students needed a different approach to their writing practice. It was clear that they needed more collaborative work because it’s difficult for students to improve their writing style from listening to their teacher explain it in a foreign language. I noticed that students were very reluctant to comment on each other’s work in a classroom discussion. I didn’t know exactly what I wanted to do, but knowing that kids are more comfortable online than they are in person, I thought I could create a forum where kids could respond to very dense topics with very elaborate Spanish grammar and feel free to make mistakes without being judged. I just knew that I needed newer methods that would meet all my students’ needs, and I wanted help from a colleague. I remembered that one of my Professional Learning Community (PLC) partners had told me that he had had a valuable experience working with an instructional coach, so I decided to reach out to Neeley and give it a try. 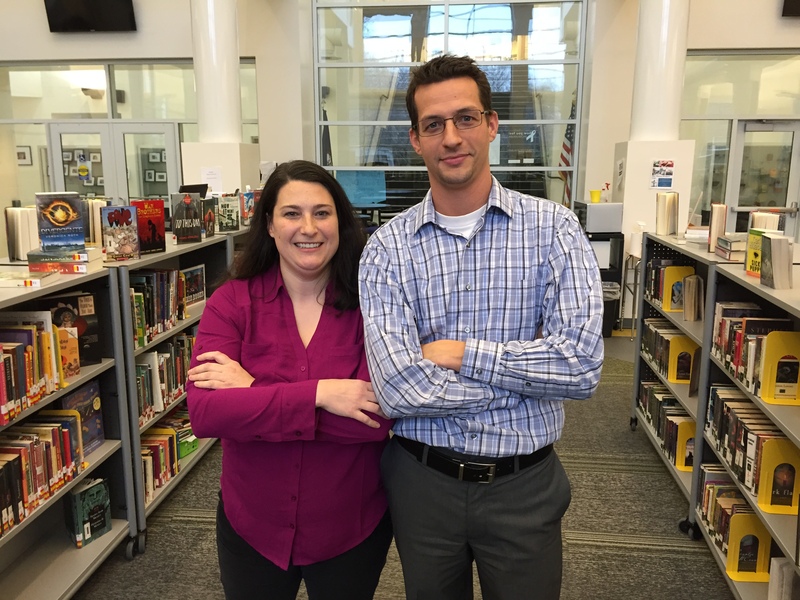 My only expectation for my first meeting with Neeley was to learn how to use a tech tool to create a forum for students to write and discuss various topics. Because Neeley demonstrated herself as a valuable resource during our initial meeting, I was able to trust her with my future lesson planning. My time is my most precious commodity; thus, I would not be interested spending it with an instructional coach unless it were benefiting my lesson planning. As Neeley and I strategized together, I began to craft my own professional development goal. I wanted to be less of an instructor and more of a facilitator in the classroom. Neeley and I developed strategies to create an environment for the students that was less teacher-centered and more student-centered. We developed lessons and activities that were both authentic and engaging. We looked at the material that needed to be taught and the methods available to us and worked until we came up the the best approach to deliver lessons. For example, we were able to use Google docs in order to come up with a better strategy for peer editing students’ essays. After collaborating in small groups to write an essay using Google docs, student groups would drop links to their essays on another Google doc so that other students could read the essays and provide feedback. The original authors could read the feedback and appreciate the comments without feeling judged, which led them to revise their own work. My role was to facilitate the Spanish because the process we had created had taken care of itself. After spending a year crafting assignments with Neeley, she asked me if I would be willing to share student work in a panel she was conducting for summer professional development. I had had a successful year developing new strategies for delivering curriculum to my kids and was very excited to share my strategies and enthusiasm with my colleagues. Looking back on my experience working with a coach, I realized that I have PLC partners with whom I can share ideas and collaborate, but their primary goal is the same as mine: to focus on their own lesson planning and support their own students. On the other hand, instructional coaches are resources whose primary focus is to aid teachers in their lesson planning and, in doing so, indirectly support their students. Would a PLC partner spend an hour of their planning time every week just to help me craft a lesson? Perhaps, but their focus is on their students whereas a coach is able to put their focus on my students and me. Could Derek have actualized his goals without his coaching partnership with Neeley? Yes, most likely. Would the experience have been as rich? No, probably not. By having teachers and coaches partner together to actualize goals, the coaching model simultaneously enriches the practices of teachers, coaches, and the larger educational community, while at the same time encouraging student growth. As teachers and coaches work together and connect with others, knowledge, ideas, and enthusiasm spread, one partnership at a time. That’s powerful stuff. Just ask Derek and Neeley.